Image caption Station manager Peter Johnson told the inquiry his crew "needed the plans"
"Vital" plans showing the layout of Grenfell Tower could not be found on the morning of the deadly fire, a station manager has told the inquiry. Peter Johnson said firefighters were unable to find documents detailing the location of utilities such as gas pipes, fire vents and dry-rise points. The plans should have been kept in a fireproof box in the building's lobby. Mr Johnson said the lack of any plans endangered firefighters and residents. "I do remember there were issues concerning the fire box and the fire box not necessarily being fully stocked with what should be there," Mr Johnson told the hearing in central London. He recalled speaking to a female council officer twice during the fire on 14 June last year about the whereabouts of the plans. He said she assured him the plans were "in the box" - but no plans came to light. 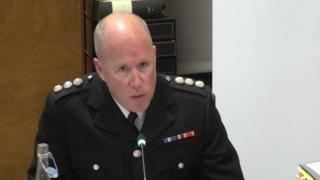 The only information fire crews had to go on was a photograph of Grenfell Tower, accessed via a mobile phone, which showed the building before the flammable cladding system was installed, he told the hearing. The 24-storey tower block had been recently renovated prior to the fire, including changes to the gas pipes and the re-numbering of flats. "The plans themselves would have fed into the operational plan," said Mr Johnson, responding to a question about whether the lack of any plans hampered the rescue effort. He agreed that not having them, hampered search and rescue efforts on the night. "It has a vital part and a vital role detailing fixed installations and detailing everything within the building," he said. "It would detail the pipeline of gas, of water, where electricity was - it was vital that we needed those plans." The west London block was owned by the council but managed and maintained by the Kensington and Chelsea Tenant Management Organisation. Mr Johnson said he never saw the revised building plans. "If, as you went higher, there were different layout of flats - that is something that would have definitely aided our crews," he told the inquiry. "If we can't isolate items, if we can't operate smoke vents, if we can't isolate dry risers where the doors are, that is potentially going to make the incident significantly worse. "That's going to affect our crews - that's going to make the response time significantly greater and it's going to put them in greater danger and the individuals inside the property in greater danger." Dry rise vents are vertical mains fitted into staircase or lift enclosures utilised by the fire brigade to quickly get water in the event of a fire.